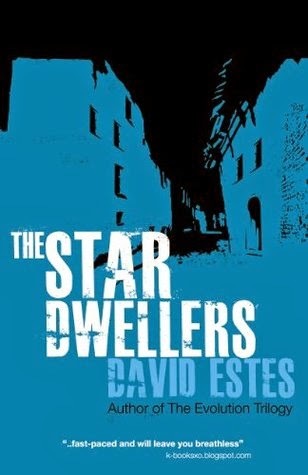 The Star Dwellers by David Estes is the second book in The Dwellers saga. Available at Amazon. You can see my review of the first book here: The Moon Dwellers. I said in my review of The Moon Dwellers that it's hard to suspend my disbelief about the setting of this dystopian world. I'm the daughter of a coal miner and a supporter of evolution - the science gets me every time the story touches on the setting. It's like a blockbuster action or sci-fi movie relying heavily on suspended disbelief (but I still watch all those movies and I'm still reading this series - I've already purchased the next book). Sometimes, I just have to tell that little voice in my head, "Shut up, this story is set five-hundred years in the future and who the h-e-double hockey sticks knows what sort of technology is in the background making it all work." There are implications of advanced technology tucked away from the seeing eyes of this world's inhabitants but readers only see what the main characters see and they aren't allowed to see much of the technology making their world work. I adore the main female character Adele. I love me some strong warrior women and Adele is shaping into one. I also fell for Ben, Adele's daddy, because he's the one who taught her how to fight (and probably because he's closest to my age bracket - the alternative is Tristan's sperm-donor, President Nailin, the antagonist). This book will probably be my favorite because of the way Ben tugged at my emotions near the end of the book. No spoilers. I bought the next book because I want to know how that situation is handled.